So here’s the recipe I wrote about yesterday – Greek-style skillet supper. It was indeed simple to prepare and the result was fairly tasty. Unfortunately I didn’t have as much feta cheese as the original recipe called for, and I think that affected the final product. Feta is a very strong cheese and the amount that I did put in the pasta was delicious, so I can only imagine that an extra 1/4 c would have been an improvement. I made due with some shredded Parmesan and Romano, but it just wasn’t the same. Still pretty good, but not the same. This could be a very versatile recipe because you can substitute just about any meat for the ground beef and add whatever vegetables you want to suit your tastes. The spice blend is really good, but I thought the pasta was a little bland so I think next time I’ll increase the amount of each one a bit to give the pasta more flavor. Dan had seconds so I know he liked it, at least. Although I think it needs a few tweaks, I would definitely recommend this recipe because I think it has a lot of potential. Cook ground beef and garlic in a large skillet on medium-high heat until the meat is no longer pink, adding the diced onion when the beef is about half done. Drain fat, if necessary (sometimes the ground beef I use is so lean that there’s almost none to drain). Add oregano, cinnamon, and garlic powder and mix well. Stir in the broth, diced tomatoes, and tomato paste and bring to a boil. 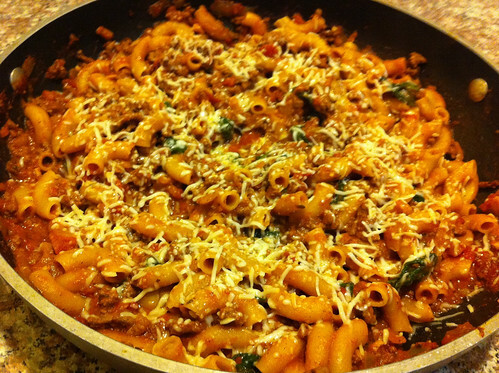 Stir in the pasta, reduce heat to medium, and cover and cook 10 minutes or until the pasta is nearly tender. Stir in spinach and feta cheese. Cover and cook 5 minutes longer or until the pasta is tender. Remove from heat, sprinkle with the Parmesan and Romano (or an additional 1/4 feta if you have it – I ran out), cover, and let stand 5 minutes before serving. Enjoy! Based on McCormick’s Greek-Style Skillet Supper. I wrote this post on Monday while sitting in the Denver airport waiting for my flight to Los Angeles. You know you can’t escape posts about food on this blog! Can you tell I was hungry when I wrote this? I’m really anxious to get back to cooking this week, even though I haven’t set a precedent of regular weeknight meal preparation (unless it’s leftovers, of course). I was hoping to get home early enough to make a Greek-Style Skillet Supper recipe from McCormick that I saw in the newspaper a couple of weeks ago. It looks simple enough, so since my flight was scheduled to arrive in Los Angeles before 1 PM I figured I would have plenty of time to go to the grocery store, pick up the ingredients, and whip up a batch for dinner. Well, the best laid plans, and all that. My original flight from Denver to LA was supposed to leave at 11:18 AM so I was very worried when my flight from Tampa didn’t land until 10:55 AM. I thought I just might have enough time to run and catch the plane before it left but it was going to be close. But then I checked my email as we were taxiing to the gate and got a message that my 11:18 AM flight had been cancelled and I had been rebooked on a flight at 2:24 PM instead. That eliminated my fear of missing my connection, but all of a sudden I was left with three hours at the Denver airport with nothing to do. So I sat down at an empty gate, where I am right now, and started writing this post. Great story, right? My life is so exciting. But anyway, back to the food! Dan and I are big fans of Greek food, especially due to its affinity for garlic, and I love the idea of a Greek-inspired meal that’s not my usual meatballs with tzatziki sauce (although I’ll probably make some anyway just in case this recipe is lacking in flavor for some reason). This recipe seems perfect for a weeknight meal, with just a few ingredients with fuss-free preparation, so I’m really curious to find out how it tastes. I was considering substituting ground lamb for the ground beef, but I’ve heard it can be very dry and it’s difficult to find at my local grocery store anyway. So tonight, assuming I have time when I get home, I will give this new recipe a try (and you know I’ll take photos and blog about it later so the results will be well documented). I’m crossing my fingers for a good meal. On a side note, I’ve wanted to try making gyro meat for a long time now, but I’ve been too afraid of an inedible or just mediocre result to attempt it yet. But since I’ll never know until I try, I should make a special trip to Whole Foods this week to get some ground lamb. I need to make a long grocery list, but right now I’m going to go wander around the Denver airport to kill some more time before my flight home. Only about an hour and a half left! I wrote this post on my flight from Tampa to Denver yesterday. I should have made more time for writing while I was in Florida, but as with most vacations, I was busy spending time with my loved ones instead of in front of a computer. Hopefully I’ll have a chance to write about the events of the past five days this week, but until then here’s a musing I started before my plane took off yesterday morning and finished before landing in Denver. I saw a couple of young girls who seemed to be flying without an adult on my flight to Denver today and it made me think about the time I first flew anywhere by myself. Surprisingly, I think it was in March 2002 when I flew from Jacksonville to Los Angeles to visit Dan during the last Spring Break of my undergraduate years. And I think my last flight that preceded that was in 1997 when I returned to the United States from Europe with my high school tour group. (I thought that Amsterdam to Atlanta flight was long, not including the snail’s pace bus ride from Atlanta to Tallahassee afterwards, but it was nothing compared to the torture Dan and I endured on our Sydney to Los Angeles flight in 2007.) I can’t believe I didn’t fly at all for almost five years. My college career was extremely busy, but travel during that time was mostly confined to the highways between Gainesville and Tallahassee – just a two-hour trip in my little Neon. Even the longer trips, like the five cross-country trips between Florida and California with my Dad, were made in my Neon. So I was already an adult the first time I flew anywhere alone, which means I should have been capable of handling the difficulties that come with it, right? Wrong. You see, because of my five-year hiatus from air travel I was unfamiliar with all of the changes that took place after September 11, 2001. I had an electronic ticket so I didn’t think I had to bring any paperwork with me to the airport, but I soon learned otherwise. When one of the curbside bag checkers made fun of me for not having a copy of my itinerary, and even laughed about it with some of his friends, I felt like a prize idiot. I didn’t know the proper post-9/11 procedures, but after being used for the amusement of a few airline employees I never made the mistake of showing up at the airport without some sort of travel paperwork again. Since then I’ve done plenty of flying by myself, for work and vacation both, and I’ve gotten it down to a science. I have fond memories of a time when flying was fun, but I’ve grown quite weary of it after all of the trips I’ve made since March 2002. Fortunately there are some benefits. I’ve been able to take advantage of the thousands of frequent flyer miles I earn each year to get tickets for Dan and me to Chicago (Fourth of July 2009) and Hawaii (November 2011). This trip to Florida pushed my mileage balance above the level necessary to book tickets for another trip to Hawaii. I can’t wait to get home and solidify those plans. I think we’ll fly in and out of Maui, but I suppose that will depend on what flights are available to book with miles. Plus, I should have enough Hilton Honors points to get us a couple of free nights at the Grand Wailea Resort on Maui. I’ve heard it’s a fantastic hotel and I always appreciate not having to pay for accommodations. I was able to use some Marriott points so that my parents and I could stay at the Tampa Airport Marriott last night, which made getting to my flight this morning was extremely convenient. I’m glad to be going home today. I might have to fly to DC again the first week of May, but that means that I have more than a month before I have to travel again and that sounds good to me. I wrote this little snippet on my flight from Denver to Tampa last Wednesday. It’s not much, but I still wanted to post it because I was so excited about being able to watch Chronicles of Narnia on the plane. I’m publishing this post via the free WiFi at the Tampa airport while waiting for the first leg of my flight home. I hope the thunderstorms stay away long enough for my flight to Denver to take off this morning! I was indeed fortunate enough to watch “Voyage of the Dawn Treader” on my flight from Denver to Tampa today. While it was nowhere near as good as the first Chronicles of Narnia movie (I would need to watch “Prince Caspian” again to compare it to that one, though) it was much better than I was expecting based on the reviews I read when it came out. I don’t remember the book as well as I would like, especially since it’s my favorite one in the series, so I can’t comment on how faithful the movie was to the original story, but I still enjoyed it. Maybe not enough to buy the DVD or download it on iTunes, but I’m very glad I got to see it. Even if it was on a tiny screen four rows ahead of me, flying cross-country on a crowded airplane. (I wonder how much the movie was edited for airline use? I might just have to get the disc from Netflix to make sure I didn’t miss anything.) I will always have a soft spot for the Chronicles of Narnia because my dad read me “The Lion, the Witch, and the Wardrobe” before I was old enough to read it myself and it’s been one of my favorite stories ever since. I’ve always been in awe of the final scene in that book. Imaging how disconcerting it would be to grow up in a world so unlike your own (Peter, Susan, Edmund, and Lucy were adults when they fell back through the wardrobe doors), but then suddenly find yourself right back in that childhood you left behind years ago. I think that would be quite a shock. Now I have the urge to go back and watch the first two movies. I’ll have to do that when I get home on Monday! 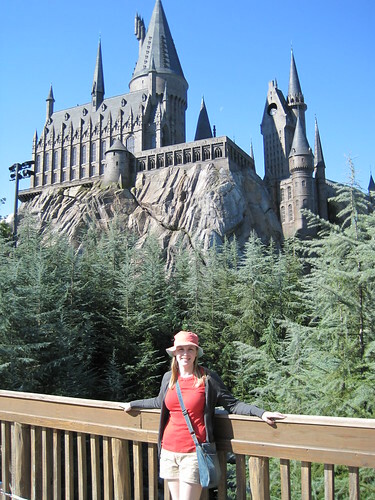 I’m flying back to Los Angeles in the morning, but I did get a chance to upload all of the photos from my fabulous vist to the Wizarding World on Harry Potter on Saturday. Here is a link to the Orlando 3/23-3/28/11 album in case anyone wants to see them. 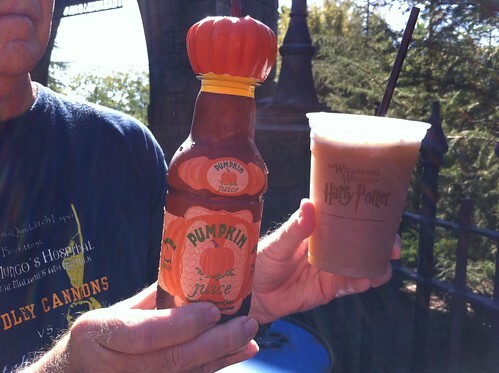 The above photo is of a bottle of pumpkin juice and a mug of frozen butterbeer that we sampled. Both were delicious, in case you were wondering. I would love to have access to these Harry Potter treats on a regular basis. My parents and I really enjoyed our time in Harry Potter’s world, but today we drove back to Tampa from Orlando and now we’re at the Airport Marriott so that it will be easy for me to get to my flight tomorrow. I’ve had a great trip to Florida, but I’ll be glad to get back home tomorrow afternoon. I just hope the predicted thunderstorms don’t keep my flight from taking off in the morning. I have a connecting flight in Denver and I don’t want to miss it because of the weather. Right now I need to re-pack my suitcase and see if I can fit everything that I brought with me plus everything that I’ve bought on this trip in it. It’s going to be difficult! I’ve been working on a webpage post, but I’ve decided that it needs a lot more work before it’s publishable. 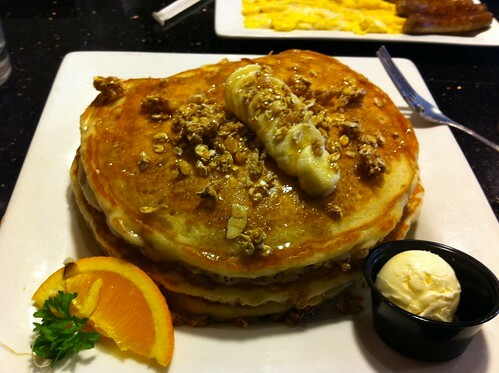 So for now I’ll have to leave you with a photo of some granola pancakes that I had for lunch today at the Florida Pancake House at the the Mall at Millenia in Orlando. My parents and I drove from Tampa to Orlando this morning and we are looking forward to going to Universal Studios Islands of Adventure tomorrow to visit Harry Potter World! I suspect the park is going to be very busy because it’s a Saturday during Spring Break, but oh well. We’ll still have a good time. Hopefully I’ll have some pictures to share tomorrow! I spent the day with my parents and grandparents. There’s plenty of stuff I could write about, but I’m tired and my brian is not working well enough to form more than a few coherent sentences. So I’m going to bed with a promise to write something interesting tomorrow. My parents and I are driving to Orlando in the morning so there’s sure to be something interesting to report when we get there! After I was already settled on my flight to Denver this morning in a window seat with an empty middle seat next to me, one of the flight attendants told me there was a first class seat available if I wanted it. Usually the perks of first class on domestic flights are lost on me so since I was already comfortable in my original seat I passed on the upgrade. Less than a minute later I regretted that decision because a huge man with an enormous briefcase sat down in the empty seat beside me. He squished me into the bulkhead while scrambling around to put on his seatbelt, and his briefcase intruded into the space where my feet would normally go. I almost asked, “Is that first class seat still available?” but I was sure it had already been given away. And since it was a fairly short flight from LA to Denver I figured the simplest option was to just keep my mouth shut and go to sleep. If only it was that simple. With the warmth of the sunlight streaming through the window, I fell asleep before takeoff. Everything was going great until the drink cart came by and this guy sitting next to me decided to wake me up by touching my leg (eww!) to see if I wanted something. No I didn’t want anything! I was asleep! My response to his query was pretty sharp so he didn’t deliberately bother me for the rest of the two-hour flight, but he was so big that he kept bumping when he moved and it annoyed me to no end. I was thrilled when we landed in Denver and folks started deplaning, but then this guy told me he was staying in his seat until everyone else got off because his bag was stowed in the back of the plane. So I had to crawl over him and his briefcase to gain my freedom. It was the most uncomfortable flight I’ve been on since Dan and I flew back from New Zealand in 2009. Right now I’m sitting in the Denver airport waiting for my flight to Tampa which has been delayed about half an hour. I just hope my seat situation on this flight isn’t as bad as on the last leg of my journey! Edited at add: There’s a woman sitting across from me at the Denver airport who is also from Los Angeles and is complaining to a friend that one of her coworkers called her $2 million house “cute.” She’s going on and on about how incredibly rude that was. The difference between her and me is that I think talking about how much your house is worth is rude, especially when it’s in the millions. I never seem to have enough time these days to do the things I want to do. Today I had to return a book to the library that I desperately wanted to finish, but didn’t want to pay the library fines necessary to keep it until I get back from Florida next week. Three weeks is just not long enough for someone who works full time to finish a 500+ page book. I’d love to have more time to read every day, but there always seem to be more pressing things to do when I get home from work each night. I’ve already put that book on hold at the library again, but I’m 51st on the list right now so it’ll be a while before I have it in hand again. I realize that I could just buy the book and read it at my leisure, but I’ve been trying to minimize the amount of money I spend of items that I don’t absolutely need. My parents gave me an Amazon gift card for my birthday in January and I still have about half of it left, but most of that money is already earmarked for a couple of books that are coming out in April (City of Fallen Angels by Cassandra Clare and Red Glove by Holly Black, both of which I’ll buy on my Kindle) as well as “Harry Potter and the Deathly Hallows, Part 1” on Blu-ray. I’m looking forward to those purchases. I’ve also been thinking about buying (or downloading) “Chronicles of Narnia: Voyage of the Dawn Treader” when it comes out because it’s my favorite book of the series, but based on the movie reviews I’m not sure it will be worth the money. The good news is that if United sticks to their advertised in-flight entertainment schedule I’ll be able to watch it on my flight to Tampa tomorrow. It’s funny that it takes a cross-country flight for me to be able to watch a movie I want to see. (Well, that or taking a day off from work. That’s how I got to see “The King’s Speech,” “Black Swan,” and “Tangled.”) To be fair, Dan and I have actually watched quite a few movies lately, both Netflix discs and movies that we own, but I’m way behind on my television watching. We make a point of watching the new episodes of the shows we watch together (“Top Gear,” “Top Chef,” “The Office”) the day they’re aired, but I just can’t seem to any time to sit down and watch the backlogged episodes of my favorite shows (mostly “House” and “The Event”) on our DVR. The only way I’ve had enough time to write this post tonight is because the Laker game is currently in triple overtime and there’s no way I’m getting off the couch before it’s over! I’m starting to get nervous because I’m leaving for Florida in the morning so far I’ve only thrown a few articles of clothing in my suitcase. I’m nowhere near ready to go. The airport shuttle is picking me up to go to the airport at 6 AM so I have a lot to do before I go to bed, especially if I want to get enough sleep to be able to stay awake on my flight so I can watch “Voyage of the Dawn Treader.” As flimsy as it is, that’s my motivation to pack as fast as possible when this basketball game is over. Go Lakers!